Buy Online Now! 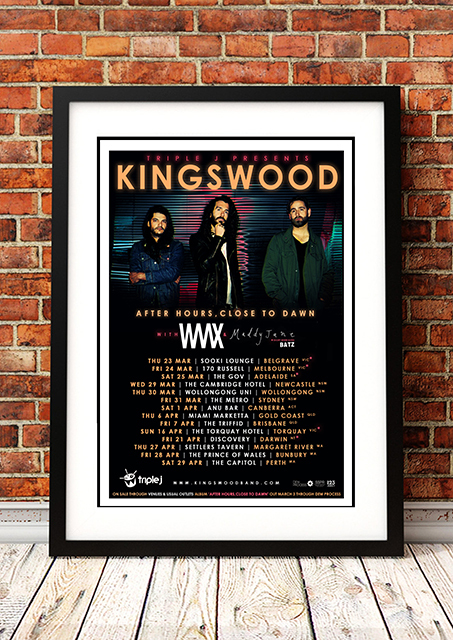 Classic Kingswood Concert Posters and Memorabilia! Kingswood is an Australian rock band from Melbourne. Kingswood have toured Australia with such acts as The Living End, British India and The Saints, and played festivals including Splendour in the Grass, Queenscliff Music Festival and Pyramid Rock. The band also released three singles “Yeah Go Die”, “Medusa” and “She’s My Baby” in 2012. In 2013, Kingswood played a national tour with Grinspoon, supported Aerosmith, played Groovin the Moo, Big Pineapple, Festival of the Sun, Golden Days and Big Day Out. The band released its fourth single “Ohio” and their EP Change of Heart (followed by a deluxe edition EP) to many positive reviews. Micro Scopic Wars (2014) reached number six on the ARIA Albums Chart. The release was nominated for Best Rock Album at the ARIA Music Awards of 2014. In February 2017, Kingswood released their sophomore album After Hours, Close to Dawn. We stock some awesome Kingswood Prints.